MLM Software in Mizoram|Shopping website in Kurukshetra|Software Development Company in NCR Delhi|Web Site Desiging Company in Kurukshetra|MLM Software in Port Blair,MLM Software Jalandhar|Multilevel Marketing software Patiala|Binary MLM software Kurukshetra|Matrix Plan Bhiwani|RD-FD software Kaithal|Gift Plan Punjab|Helping Plan Ludhiana|mlm software in Chandigarh|mlm software in Patiala|mlm software Ludhiana|MLM Software Jaipur|Lucknow MLM Software|Patna, Bihar Mlm software|MLM software in Utterakhand|mlm software utter Pradesh|mlm software tripura|mlm software Tamilnadu|MLM Software in Pundicherry|mlm software Jammu & Kashmir|MLM software west bengal. iSHA Web Services offers affordable content management conversion, which converts your existing website into content management system framework like Joomla, Wordpress, Drupal, Simple CMS, Etc. giving you full control to update many aspects of your website, including text, images, links, and more. The conversion process maintains the same design of your existing website, while greatly enhancing it on the back end. Not only do you have the ability to add content, but all content you add is automatically optimized for search engines, such as Google. You take advantage of an immediate ROI by reducing your dependence on expensive web consultants to keep your site up to date. If you would like more information, please Contact us today or Request a Quote. 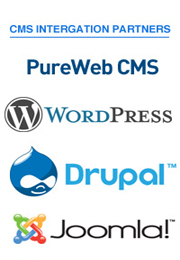 A CMS web site have capability to scale. This allows you to create and store hundreds or thousands of pages in the database without the need to update each one of them. - The design of the site template is separate from the content. This allows you to change the design any time without affecting the content stored on the site. Use cascading style sheet (CSS) to control site appearance. - Altering one CSS file will allow you to change the design and/or color of your CMS site. The consistency of the design can be preserved. - If you have different authors that wish to contribute to your CMS web site you can set up multiple user access in the administration panel. They can just login and begin adding their content. - Authors and editors can access the site from any computer with an internet connection. This means users can update the site at the same time from any location in the world. - The backend administration panel not only provides the ability to add content but also to add modules such as polls, banners, forums, shopping applications, news management and menus. Authors can be given limited permissions to prevent them from editing content which they are not authorized to change. - Publishing content can be controlled by creating a draft first then publishing it later. This is handy if you need to coordinate content from multiple authors. - - A CMS site allows non-technical people to add content. They just need to login with a user name and password then use the web editor that’s built into the CMS to add their content. - If you were using a static site to add content from multiple authors, each author would have to download the pages from the server to their computer first, update them, then upload them back to the server. This would be very time consuming and could generate a lot of errors. - - The separation of content from design allows you to easily include keywords in the URL of each page. If the title of your article was “Content Management System Benefits” your URL would be written as: http://www.domainname.com/content-management-system-benefits Some CMS sites automatically generate the correct meta tags for each web page which would help them to spidered by the search engines.